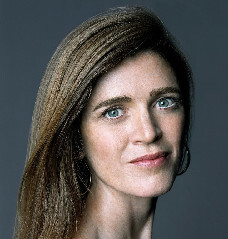 Samantha Power | can i just finish my waffle? God help us, may we never again elect a Harvard professor to the presidency again. Syria is slaughtering its own people, the Palestinians wage ceaseless warfare against the Jews, the Middle East is being cleansed of its Christians, Africa is wracked with asymmetrical battle waged by thuggish warlords, and Barack Obama offers the world… the Atrocities Prevention Board. Atrocities Prevention Board! It’s not a joke. He actually has instituted a panel called the Atrocities Prevention Board as a response to on-going slaughter. And not only that, he appointed Ms. Cass Sunstein, Samatha Power, to head it up. This administration is NUTS. And that’s being kind. I did a short study on the fine Mz Power-Sunstein some time back. Posted: 04.26.12 @ 4:01 p.m.